The Southwest Through Wide Brown Eyes: The Charm of a Barn. The Charm of a Barn. If a barn could speak, what secrets and stories would it reveal? Surely it would tell of the birthing of a calf or foal; the death of a long milked cow or well ridden mare. Amongst the hay bales the trails of rodents hunted by cats; or lovers having a roll around. Musings of a daydreamer, perhaps, but there is something about a barn that has rustic charm and brings about wonder. The basic definition (FreeDictionary.com) of a barn is, “A large building for sheltering livestock, storing hay or other agricultural products, or housing equipment used for operating a farm. 2. A large shed for the housing of vehicles, such as railroad cars.” Actually there are various sites giving either less or more of a definition, but to store or shelter is the main focus of a barn’s existence. While some think, “this is nothing more than a utility building”, for others, like the Amish and Old Order Mennonite, the barn is not just an important feature of farming, but of overall life on the farm. A “barn raising” is a huge deal in the community; families come by horse and buggy; the men to build the structure while the women prepare the feast to be enjoyed later on, and a bit of gossiping too. It is the “community center” for parties, dances, wedding receptions, basically all social gatherings. 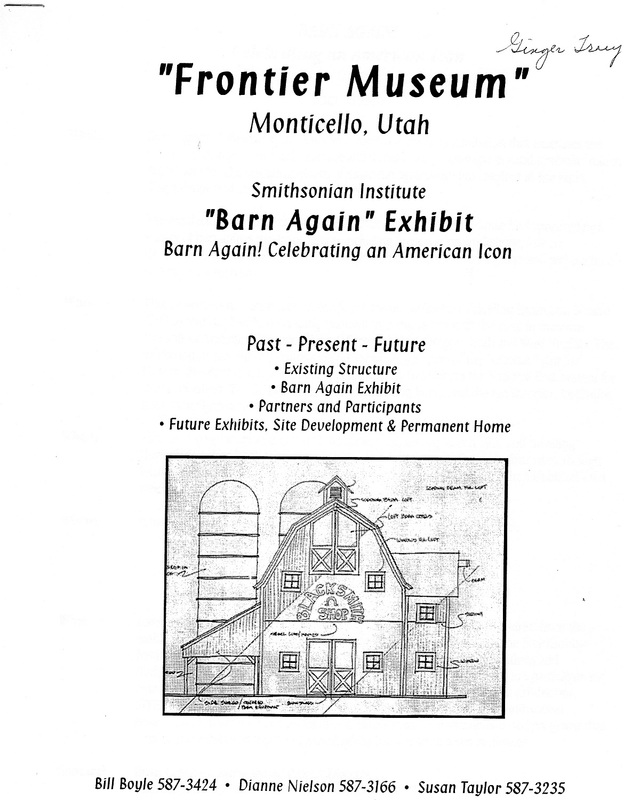 Back in 1997, the Smithsonian Institute developed a nationwide tour, “Barn Again! Celebrating an American Icon”; visiting four rural sites in designated states, one of which was Utah; Wellsville, Heber City, Monticello (July/August 1998) and Ephraim. 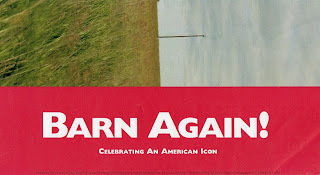 The focus: who, what, where, why, where and how of an American icon…The Barn. 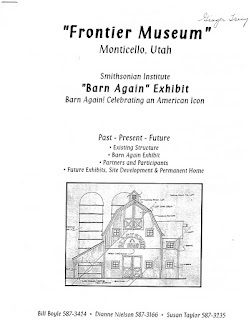 Featured in the Monticello site was the early 1900s built barn which became the Frontier Museum. 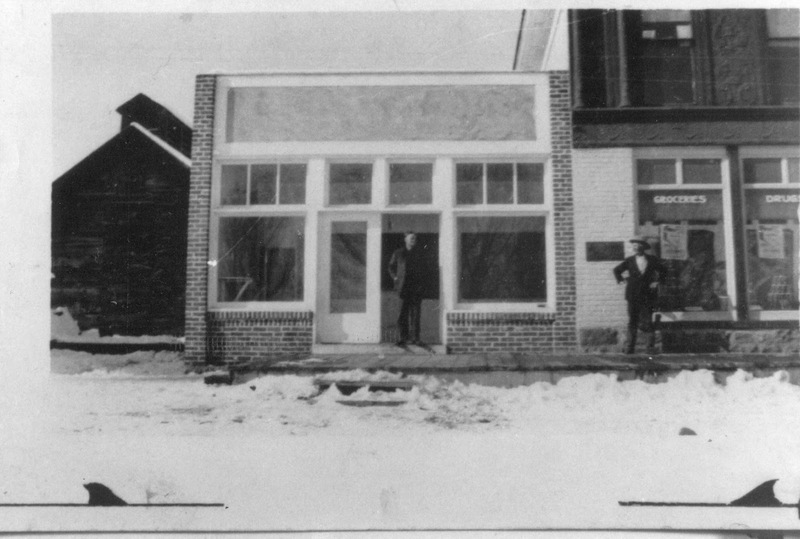 Originally a storage facility for the L.H. 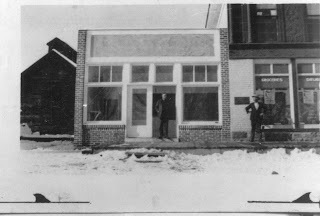 Redd Hardware/Mercantile, it was moved to its present location on Main Street (purchased by the City of Monticello) due to the tireless effort of the Monticello Foundation, headed by San Juan Record’s Bill Boyle. Main Street between 200 and 300 South - given to Ginger Tracy by Joyce Martin; San Juan County Historical Commission. Barn seen to the left of the Post Office. Missy Votel of Durango’s Cross Currants wrote, “First order of business was to move the barn….back corner of lot, away from street, to front and center…put on rollers and moved approximately 60 yards.” The barn was of simple design, one entry way, one window, nothing to truly write home and brag about; but it was historic and needed to be preserved. Temporary shingles were put on to keep out the elements; built on were an entry way and small storage room; eye pleasing features of faux barn doors and hayloft pulley were added. Inside electricity and plumbing needed to be installed; the second floor (hayloft) could only be accessed via ladder (donations and grants needed to install an elevator, and not achieved as yet). In 1998, plans by the City included a Visitors Center which was built in 2008 and is attached to the museum; 2013 saw the creation of the Big 4 Tractor Building which houses, of course, the Big 4 Tractor. The field next to this building was, more than likely, for the Community Center proposed in 1998; however, that is now located at the Hideout Golf Course. The field is used during Pioneer Day weekend activities for the Mud Tractor Pull; a huge attraction for locals and visitors alike. The first curator, and largest donor, to the Frontier Museum was Nell Dalton; after her death, her daughter, Ginger Tracy, became curator. 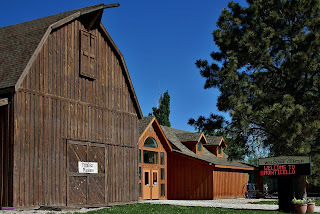 With her help, I was able to amass photographs, newspaper articles and information about the barn. The museum is an eclectic collection representing Monticello and San Juan County’s Native Americans, the Pioneers and their descendants. Framed black and white photographs, historical documents, memoirs; kitchen gadgets that make many a visitor state, “I remember my grandmother using that!” The Hyland Hotel (National Register of Historic Places – July 28, 1994) is a featured exhibit, as well as Marie Ogden’s “new age cult”, The Home of Truth which has been written about by BYU Professor, Joel Campbell, and Emma Kemp, an instructor at California Institute of the Arts and Otis College BFA Fine Art of Arts. 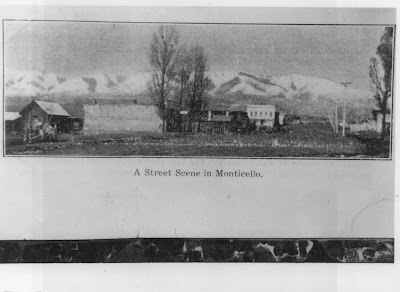 At one time, the City’s “museum” was located in the San Juan County building; artifacts stored in the cellar. This was all transferred to the Frontier Museum once it had been established. The second floor is closed off and contains all those artifacts not designated for display…yet. Plans are in the works for a “rotation” system, and new donations, whether monetary or artifacts, are always welcomed! Main Street Quilt created for 100th Anniversary of Monticello's Founding. ﻿﻿ Whether a local who walks by, or a visitor driving in for a rest stop, come on into the Frontier Museum and have a look about. You never know what you’ll find. Leisurely Drive Through the Indian Creek Valley.